A three part series on BBC4 entitled ‘Illuminations; the Private Life of Medieval Kings’ begins at 9pm on Monday 9 January 2012. One piece of the filming for part two took place last September in St George’s Chapel. 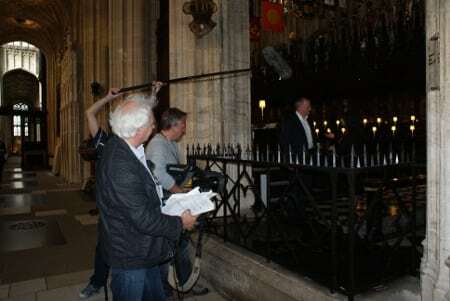 The photographs show the film crew outside the south front and also recording near the tomb of Henry VI in the South Quire Aisle. Art Historian Dr Janina Ramirez tells the story of medieval monarchy as preserved through illuminated manuscripts from the current British Library manuscripts exhibition. The series runs chronologically from King Athelstan in the 10th century to King Henry VIII. St George’s hosted a visit from a group of international scholars shortly before Christmas. They had all attended a two day conference at the British Library linked to the exhibition. The visitors were given a brief tour of the Chapel by the Chapter Clerk in which she focussed on the role played by Edward IV in St George’s history. The archivist and chapter librarian, Dr Clare Rider, then showed the group manuscripts, seals and other items from St George’s archives all linked to Edward IV. The emphasis on King Edward IV stemmed from the fact of the key role he played in the formation of the first royal library; following the scholars’ visit to St George’s the group visited the present day Royal Library.